Prove yourself worthy to join the Imperial Legion. Clear out bandits from Fort Hraggstad. Take the Imperial Legion oath. "I'm telling you, Ulfric's planning an attack on Whiterun." Whenever you meet soldiers of the Imperial Legion, they will encourage you to travel to Solitude and join. In Solitude, the guards will point you towards Legate Rikke at Castle Dour. When you enter, you will witness Rikke trying to convince an ill-informed General Tullius that Nords will follow their traditions, even in a time when loyalty is tested. 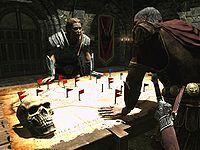 Apparently, rebel leader Ulfric Stormcloak is preparing to attack Whiterun so the two strategists have their hands full. General Tullius will soon approach you and recall you from Helgen. He will then point you towards Rikke for more information. Rikke will commend you for surviving the destruction of Helgen and tell you that she's arranged a small test of your skills before you're allowed to join the Legion. When asked which test she will explain: "The kind that evaluates your usefulness during... duress. I'm sending you to clear out Fort Hraagstad. If you survive, you'll pass. If you die, then I'll have no further use for your corpse." She will then explain that the Legion will set up a garrison at Fort Hraggstad but that the place has been overrun with bandits and needs to be cleared. She will not take no for an answer and will just angrily say: "What's the matter, soldier? I gave you an order. I want that fort, and I want it now. Move it!" The fort is located near the Thalmor Embassy, west of Solitude in the snowy terrain past Wolfskull Cave. Once there, a number of bandits will attack you on sight. The fort has archers, atop towers, so approach with caution. Once the exterior area is clear, locate the entrance to the fort and enter. It consists of two interior zones: the main zone and the prison, both of them accessible from separate entrances in the courtyard. In the prison, two bandits await you in the first room, with another guarding the area downstairs. In the main zone, two bandits and their chief will ambush you upon entering. You can find a copy of the Archery skill book, The Gold Ribbon of Merit upstairs. When all is said and done return to Legate Rikke in Solitude. "Upon my honor I do swear undying loyalty to the Emperor, Titus Mede II..."
"...and unwavering obedience to the officers of his great Empire." "May those above judge me, and those below take me, if I fail in my duty." 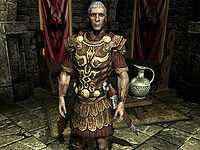 Tullius will then welcome you to the Legion and send you to the castle's blacksmith, Beirand, who will equip you with a set of Imperial armor. You may choose heavy, medium, or light Imperial armor. The light set contains the light variation of Imperial armor, the medium set contains a set of Imperial studded armor and an Imperial shield. Once Tullius has sent you towards Beirand the quest ends and the next one starts, your first assignment for the Empire as an Auxiliary of the Imperial Legion, The Jagged Crown. On completing this quest you will immediately fail the Joining the Stormcloaks quest. You can still join the Imperial Legion after completing the Dark Brotherhood. The oath you take upon joining omits "Titus Mede II", but he'll still say "Long Live the Emperor!" Even though Legate Rikke says she will send troops to garrison the fort straight away if you return to Fort Hraggstad before speaking to her Imperial soldiers will already be present. Because you have not taken the Imperial oath yet you will be trespassing if you enter the buildings and you will get attacked if you do not leave. You may encounter a bug/message "No Active Quest" or when you get closer to the fort the quest arrow may just disappear. Go ahead and clear out all the bandits around and in the prison first. Then, head to the main zone. The quest arrow will then reappear and point to the chief bandit. You can then properly clear out the fort and complete the quest. The objective Join the Imperial Legion may disappear from your list of miscellaneous objectives even though you have not chosen a side or taken any steps in the civil war questline. 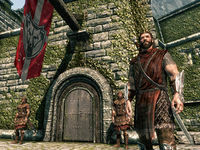 Going to Castle Dour and speaking to General Tullius may complete the quest successfully and begin the Imperial Legion quest, Joining the Legion. ? The following empty quest stages were omitted from the table: 0, 150. On the PC, it is possible to use the console to advance through the quest by entering setstage CW01A stage, where stage is the number of the stage you wish to complete. It is not possible to un-complete (i.e. go back) quest stages, but it is possible to clear all stages of the quest using resetquest CW01A.